1.Make sure that your phone is paired and linked to HFL. 2. Rotate to select Resume/Pause, then press . Each time you press , the setting switches between Pause and Resume. To play the audio files, you may need to operate your phone. If so, follow the phone maker's operating instructions. The pause function may not be available on some phones. 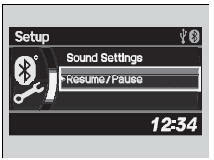 If any audio device is connected to the auxiliary input jack, you may need to press the AUX button repeatedly to select the Bluetooth® Audio system. Switching to another mode pauses the music playing from your phone.